Team Secret received a tier 1 invite for the European qualifier of ESL One Hamburg, thus their adventure started in the quarterfinals. Elements Pro and MidOrFeed did not represent a problem for the team captained by Puppey, that defeated them without dropping a single game. The finals featured a best-of-five matchup against SFT esports, which roster changed at the end of the summer. It was a clean 3 to 0 victory that granted Team Secret the participation at the first ESL Major. In the early game Secret focused the Necrophos offlane, who died three times, while also disturbing the farm of a mid Drow Ranger. Only a few fights happened in the first 30 minutes of the match - both teams were concentrated on farming their cores. At 31 minutes, SFTE lost the first teamfight, followed by four more in the successive 10 minutes. At the same time, Secret only saw two deaths in their ranks. The match quickly escalated and ended with a 30k gold lead. Yeik "MidOne" Nai Zheng was a real nuisance in teamfight with Phantom Lancer, but the man of the match was Adrian "Fata" Trinks, who scored 12-2 with his Queen of Pain. Also in game two Team Secret maintained the net worth advantage at any stage of the game, but this time the battle ended with a 33-33 score. Teamfights continued exploding on the map. Secret had as many losses as SFTE, in fact the gold difference never went past 5k up to the very end. 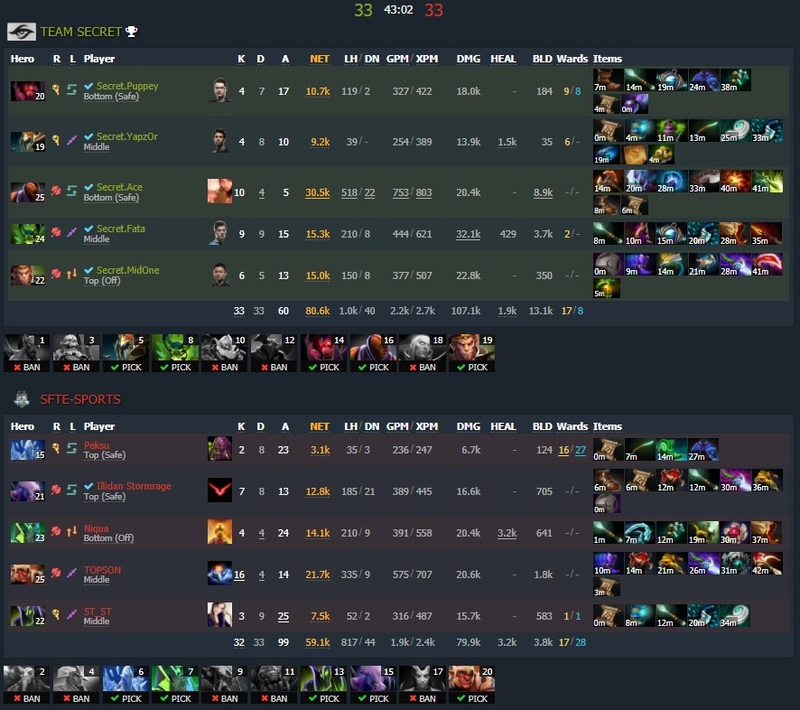 SFTE lost the match due to a double team wipe at 42 minutes, who opened the road to victory for Secret. Both teams were very aggressive also in the third match, and SFTE had the upper hand during the early game. The situation reverted at 15 and 17 minutes thanks to two consecutive teamfights. Clement "Puppey" Ivanov, on Bounty hunter, was the reason behind this sudden surge of gold: he strategically Tracked almost all the kills carried out by his teammates. After a disastrous teamfight at 42 minutes, that saw six heroes of SFTE traded for a single Rubick, Secret conquered the Bo3 with a 27k lead. ESL One Hamburg will see eight teams battle for a $100,000,000 prize pool from October 26th to 29th. Team Liquid and Newbee received a direct invite to the LAN, while the remaining teams earned their spot through regional qualifiers. Right now only the NA and SA teams are missing.